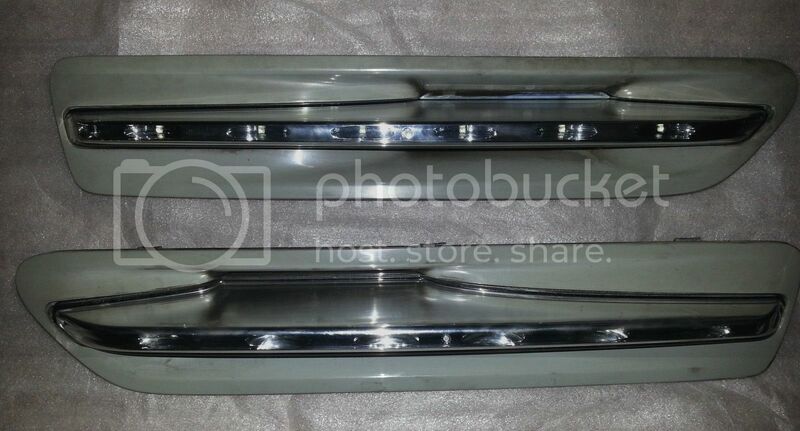 There's aftermarket 8 piece sets of chrome covers for door handles available off ebay.com.au at around US$55 for a full set with free shipping to me. I have no idea what the quality is like. I'll try and check out genuine Holden items and see how that compares. 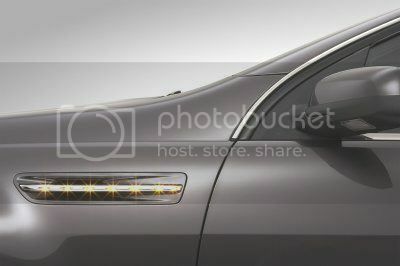 (Yes....full exterior surface chrome, not the chrome edged ones like on Pontiac G8). Thanks for the response, description and application. Will probably do this in the next two months. The chrome center section snaps into the the outer shell. I took the chrome piece off along with the rubber grommet and had the shell painted when I got my spoiler painted. The center chrome section snapped back in and the whole thing snapped into the fender. The one end of the wire connects into the lights, the other end I cut off and ran extra wires up to the headlight. Paul was correct, (thanks Paul) the color of the left turn signal is light blue with a white stripe and the right is dark blue with a white stripe. I got one hooked up and it looks cool. I have the chrome door handle covers. I bought them off of some guy on eBay. I like the look, I don't know how long they will last, they are plastic. Watch this video at the 1min 35second mark they show the side indicators in the Holden WM Caprice fender vents working. Crazy Paul wrote: I can do a pair of the Holden Caprice side indicator (repeaters) complete with a pair of wiring connectors for US$333 total shipped. Airfreight ETA is 14 days. The wiring connectors are approx 6" long and plug into the odd shaped connectors on the inside of the repeaters. You can then run new wiring back to within 6" from the repeater and make your new wiring connection on each side of the car. Is the price for these still the same? I would like to order a set of these repeaters for my PPV. Thanks Paul. Got my lights today. I appreciate your quality service. Is the price on the repeaters still the same? Also, what happened with the door handles. I've seen pics of Aussie Caprices with cool looking chrome lined/body color handles. I want that. bkwagonss wrote: I'm having a heck of a time trying to figure out which wire(color) goes to the corner turn signal light in the headlight housing. I assume it's one of the wires in the headlight housing connector. If it's the same as a Holden WM Caprice Series1 (???????????) then at the 10 Cavity Connector for each Headlamp. Left Headlamp, Left Front Turn Signal Supply Voltage = Pin 9 = Light Blue Wire with a White Trace. Right Headlamp, Right Front Turn Signal Supply Voltage = Pin 9 = Dark Blue Wire with a White Trace. I just bought a pair of repeaters off ebay.au and will be hooking them up sometime this summer. My question is about the ground wire. Where did you hook that up to? Is it obvious? (I haven't looked at my front signal connector yet). Oh man, I wish I knew you were looking. I am wanting a set too, but have been putting off making a purchase because of the cost. Then.... well, the well dried up! CrashTestDummy wrote: Oh man, I wish I knew you were looking. I am wanting a set too, but have been putting off making a purchase because of the cost. Then.... well, the well dried up!